Hello Bloggies. I am here to write the review of Golimaar as Reviews dena padtha hain humara bloggies ke liye . 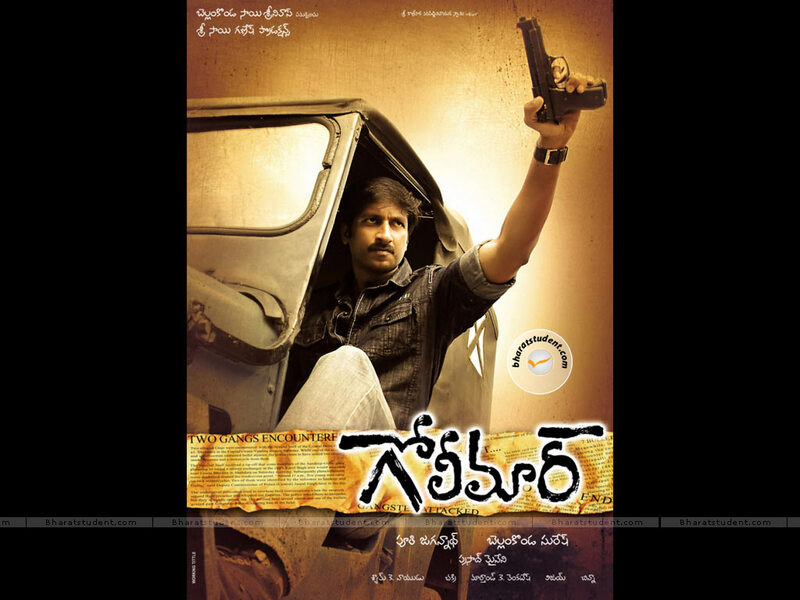 GangaRam (Gopi Chand) is a orphan who has a dream to become police from childhood . With his sheer success and hardwork Gangaram becomes Encounter Specialist. His target is to eliminate the gangs of Khaleel ( Kelly ) and Talwar . Pavitra is a event organizer who hates boys always , as its comes from her mother Roja . So , how pavitra falls in love with tough cop and how GangaRam Succeeds in eliminating the bad boys is rest of the story . Gopi Chand as tough cop impressed well with his extraordinary performance .His dialogues like 'Dhamki Dena Padtha hain' and pre interval dialogue is mind-blowing. Priyamani as Pavithra is impressive,but sloggy at times .Costumes haven't suited to Priyamani . May be puri taught of giving some dominant role to Roja ,and he had given the same to Roja, but still we feel that something is missing from her role . Roja and Priyamani given their own dubbing in the movie. Others has done well according to their roles. Ali's character should have been extended . Puri has came up with the same old story . We can say this movie as Pokiri 2. But , even though he framed the story very well . He shown heroism very well in the movie. Cinematography by Shyam .K . Naidu is brilliant . He worked in all Puri's earlier films . Editing was done by Marthand K Venkatesh. So , no need to find any patches from Marthand.Chakri's music is not much impressive. Background music looks similar to Pokiri.Only 2-3 songs are fantastic like Salaam Police,Golimaar title track. Nidraosthale song is the copy cat of song from Hollywood flick Desperado. Mumaith Khan debuted as a singer in this movie where, she sang theenmaar song . Movie is totally a commercial flick and don't know how this movie reaches to movie freaks . But ,I enjoyed this movie very well full to masti bcaz of GopiChand's exquisite performance.Police wale ne yeh movie toh dekhna padtha hain .